Pharmacovigilance (PV) databases record the benefits and risks of different drugs, as a means to ensure their safe and effective use. Creating and maintaining such resources can be complex, since a particular medication may have divergent effects in different individuals, due to specific patient characteristics and/or interactions with other drugs being administered. Textual information from various sources can provide important evidence to curators of PV databases about the usage and effects of drug targets in different medical subjects. However, the efficient identification of relevant evidence can be challenging, due to the increasing volume of textual data. Text mining (TM) techniques can support curators by automatically detecting complex information, such as interactions between drugs, diseases and adverse effects. This semantic information supports the quick identification of documents containing information of interest (e.g., the different types of patients in which a given adverse drug reaction has been observed to occur). TM tools are typically adapted to different domains by applying machine learning methods to corpora that are manually labelled by domain experts using annotation guidelines to ensure consistency. 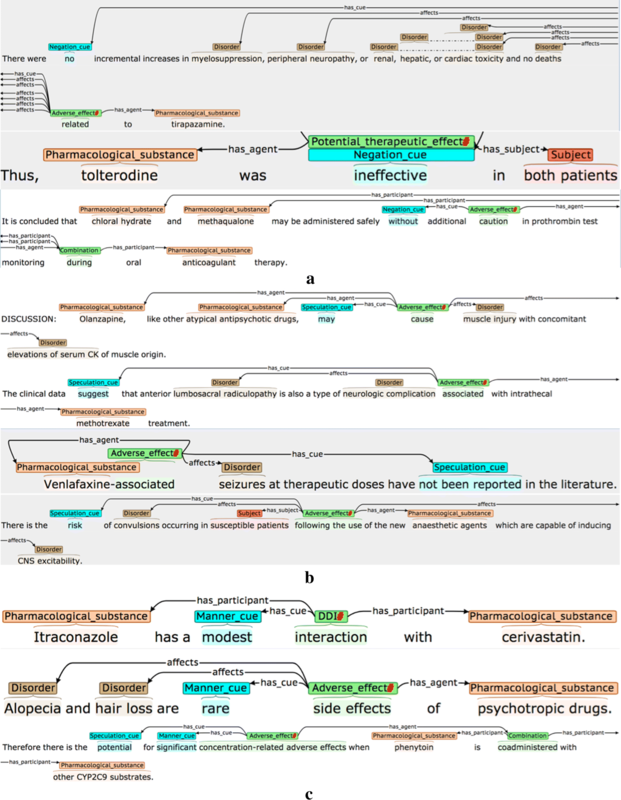 We present a semantically annotated corpus of 597 MEDLINE abstracts, PHAEDRA, encoding rich information on drug effects and their interactions, whose quality is assured through the use of detailed annotation guidelines and the demonstration of high levels of inter-annotator agreement (e.g., 92.6% F-Score for identifying named entities and 78.4% F-Score for identifying complex events, when relaxed matching criteria are applied). To our knowledge, the corpus is unique in the domain of PV, according to the level of detail of its annotations. To illustrate the utility of the corpus, we have trained TM tools based on its rich labels to recognise drug effects in text automatically. The corpus and annotation guidelines are available at: http://www.nactem.ac.uk/PHAEDRA/. Pharmacovigilance  (PV) is a vital activity that assesses drugs, in terms of risks and benefits, in order to validate and improve upon their safety and efficacy. Monitoring the effects of drugs is important to determine the effectiveness of treatments in patient populations. In addition, the identification and understanding of adverse drug effects (ADEs) is important for risk assessment. Information about ADEs is also important for stratified medicine, which seeks to identify how drug response may be stratified across patient subgroups . PV is a well-established field, and its research outcomes are used in the creation and update of reference resources that record detailed, evidence-based information about drugs, their effects and interactions (e.g., [3–7]). Since it is estimated that at least 60% of adverse drug reactions are preventable , such resources are of critical importance in analysing the appropriateness, effectiveness and safety of prescription medicines. However, maintaining these resources is extremely difficult. Firstly, they are typically manually curated, meaning that they are reliant upon dedicated and intensive efforts of domain experts to carry out extensive surveys of literature and other relevant information sources. Secondly, they can never be considered to be complete, due to the constantly changing evidence about the effects of existing drugs and the development of new drugs, which may be reported in a wealth of different textual resources. Given the growth of textual data, it is becoming impossible for domain experts to manually curate the information contained within them in an efficient and timely way. Potentially vital information may remain hidden in a deluge of results that are returned when querying these sources. The difficulties in creating and maintaining comprehensive resources are highlighted in a recent survey of several frequently-used drug interaction resources , which found several discrepancies amongst the resources, in terms of factors such as the scope of reactions covered, completeness of information about the reactions and consistency of information between the resources. Such inconsistencies could result in patient care being compromised. In order to mitigate such issues, text mining (TM) techniques have been proven to form the basis for more efficient solutions. They have been used to detect information relevant to drug effects in a range of potentially complementary information sources, including the scientific literature [10–12], electronic health records [13, 14], product labels [15, 16] and social media [17–21], along with pharmacokinetic [22–26] or genetic [27–29] evidence for these effects. TM methods have been used to semi-automate the curation of a number of databases in areas such as biomedicine , pharmacogenomics  and drug side effects , by increasing the efficiency with which articles of interest can be identified and/or by automatically locating relevant details within these articles. Furthermore, TM can be applied to the contents of such databases to uncover meaningful associations amongst drugs . Particularly in the field of biocuration, much attention has been devoted to ensuring that TM methods can be effectively translated into tools that can increase the efficiency of curators’ tasks [30, 33–35]. Additionally, given the variability in curation tasks and working methods, efforts have been made to increase the flexibility with which different TM tools can be integrated within curation workflows in different ways [36–38]. The level of TM-driven support that can be provided to curators for particular tasks is dependent on the sophistication and performance of the tools that are available for a given domain/subject area. The development of such tools is typically reliant on the availability of annotated corpora, i.e., collections of texts manually marked up by domain experts with semantic information pertaining to a domain, which are used for training and evaluating text mining tools. The levels of semantic annotation in different corpora determine the types of information that can be recognised by TM tools. Named Entities (NEs), i.e., semantically categorised words/phrases, such as drugs and disorders, form the basis for a number of more complex types of annotation. Several efforts have produced corpora annotated with such NEs and/or demonstrated how such corpora can be used to train machine learning (ML) tools to recognise NEs automatically to high degrees of accuracy [39–50]. In many cases, the annotation process involves linking each NE with a unique concept identifier in a domain-specific terminological resource. These resources include the UMLS Metathesaurus , the Medical Subject Headings (MeSH) , DrugBank  and ChEBI . Such linking is important, because of the wide range of ways in which a given concept may be mentioned in text. For example, variant mentions of the disorder concept dyspnea may include spelling variations (dyspnoea), completely different forms (e.g., shortness of breath), abbreviations (e.g., SOB) and altered internal structures (e.g., breath shortness). Similarly, the medication etanercept may be mentioned in various forms, such as a brand name (Enbrel), a different form (Tumor Necrosis Factor Receptor IgG Chimera), or an abbreviation (ETN; TNFR:Fc). The NEs in several corpora relevant to PV include manually-assigned concept IDs (e.g., [44, 45, 54, 55]). Such corpora can facilitate the development of normalisation methods (e.g., [56–59]), which aim to automatically assign a concept ID in a given terminological resource to each NE. The challenge of this task is that, although terminological resources usually list some synonyms/variant forms for each concept, the range of variants that can actually appear in text is far larger, and mostly unpredictable. However, successful normalisation makes it possible to develop search tools that can automatically locate all mentions of a concept of interest in large collections of text, regardless of how the concept is mentioned. Binary relation annotations link together pairs of NEs whose textual contexts connect them in specific ways. 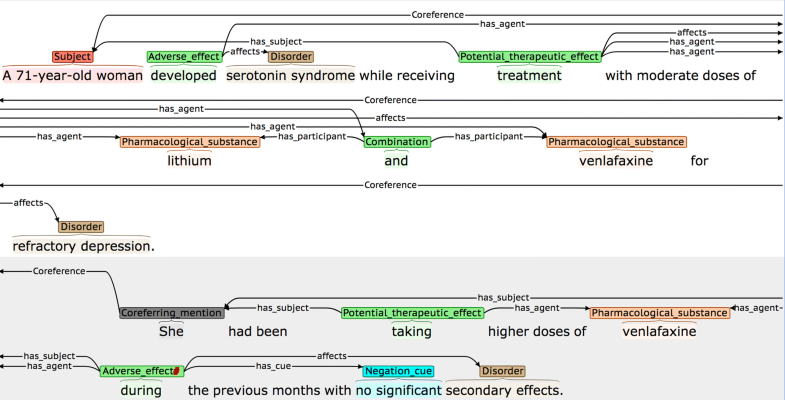 The wide range of corpora annotated with binary relations relevant to PV (summarised in Table 1) mainly concern interactions between pairs of drugs (see sentence S1), or different types of relationships between disorders and treatments, e.g., a treatment may improve, worsen or cause a disorder (see sentence S2). It has been shown that corpora annotated with binary relations can be used to train automated tools to recognise relations in text types with divergent characteristics [46, 67–73], thus allowing the discovery of high-accuracy evidence from multiple information sources that can satisfy a particular information need, e.g., the set of disorders reported to be adversely affected by a given drug. (S3) We hypothesize that a pharmacodynamic or pharmacokinetic drug interaction between venlafaxine and trimipramine involving the CYP2D6 isoenzyme may have played a role in inducing the seizures. (S4) MM patients treated with thalidomide and doxorubicin have a high risk of developing DVT. (S5) We describe a life threatening side effect of acute epoprostenol infusion (pulmonary edema) in a patient with pulmonary hypertension associated with limited scleroderma and discuss its management and potential etiology. (S6) Marked elevation of serum CK may be a possible complication of olanzapine therapy. In this article, we describe the development of a novel annotated corpus, PHAEDRA (PHArmacovigilence Entity DRug Annotation). Uniquely within the field of PV, the 597 abstracts in the corpus include annotations that go beyond binary relations, to encode more complex information, such as the cases exemplified above, in a structured manner. It is intended that PHAEDRA will encourage the development/adaption of machine learning based text mining tools for extracting PV-related information from text, at a level of complexity that has not previously been possible. Ultimately, it is hoped that such tools will lead to the provision of curator-oriented applications that provide sophisticated, efficient and flexible means to explore and pinpoint relevant information in different textual sources, and thus help to increase the coverage, consistency and completeness of information in PV resources. Three types of NEs that correspond to the important details about drug effects, i.e., drugs, the disorders that they affect and the medical subjects in which the effects occur. We apply an automated normalisation method , to link drug and disorder NEs with concept IDs in terminological resources, i.e., MeSH  and SNOMED-CT , respectively. Four types of complex relation annotations, called events , which link together an arbitrary number of participants (either NEs or other events), to encode detailed information about the behaviour and effects of drugs. Events have previously been used to encode a range of information in texts with divergent characteristics [42, 76–80], and can be recognised automatically by a number of configurable tools [81–92]. Events alleviate several issues with binary relations. For example, our event types Adverse_Effect (AE) and Potential_Therapeutic_Effect (PTE), which, respectively, encode the harmful and potentially beneficial effects of drugs, identify participants that correspond not only to drugs and the disorders that they affect, but also the medical subjects in which the effects are observed to occur, as in sentence S4. Our DDI and Combination event types, which encode cases in which multiple drugs are administered together or interact with each other, can themselves act as participants of AE and PTE events. This makes it possible to encode complex causes of drug effects, which involve multiple drugs (as in sentence S3). Three types of interpretative attributes assigned to events, which encode whether the events are negated, speculated (sentence S6) and their manner, i.e., whether the strength, intensity or frequency of the event is low, high or neutral. This latter information may be relevant in assessing the balance between the risks and benefits of taking particular (combinations of) drugs. For example, the phrase life-threatening in sentence S5 denotes a severe adverse reaction. In contrast, a modest adverse reaction may be considered acceptable, especially if there are other significant benefits to be gained by taking a particular drug/combination. Various studies have annotated and/or developed automated methods to predict similar attributes for events in other domains (e.g., [93–98]). Two types of static binary relations between NEs. These are used, as in other event-annotated corpora [76, 99, 100], to encode more detailed information about event participants, and have been shown to improve event extraction results . Subject_Disorder relations link medical subjects with their conditions at the time that a treatment is administered. An example of such a relation is shown in sentence S7; structured relationships such as the one shown between 60-year old woman and diabetes mellitus would make it possible to explore, e.g., the range of disorders suffered by patients who have such an adverse reaction to gliclazide. Relations of type is_equivalent link together different names for the same concept (e.g., full name and acronym/abbreviation, brand name and common name for a drug). These relations can supplement our automatically-added associations between NEs and concept IDs in allowing links to be established between events that refer to a common concept in different ways. (S7) A 60-year-old woman with diabetes mellitus developed an acute icteric hepatitis-like illness 6 weeks after the initiation of gliclazide therapy. Co-reference annotations between anaphoric event participants and their co-referent NEs in nearby sentences. Our annotation scheme requires that all participants of a given event occur within a single sentence. However, some participants may correspond to anaphoric expressions, such as it, the drug, this disease, etc., referring to NEs introduced earlier in the text. We allow event participants corresponding to anaphoric expressions to be annotated, but require such expressions to be linked to their co-referent NEs in other sentences, to allow events to be correctly interpreted . Co-reference annotation efforts in other biomedical corpora [102, 103] have been used to demonstrate the feasibility of developing novel approaches to co-reference resolution [104–106]. The creation of PHAEDRA was driven by detailed annotation guidelines, developed in consultation with domain experts, and used to ensure consistent annotation. Such consistency is quantitatively demonstrated by generally high levels of inter-annotator agreement, reaching as high as 92.6% F-Score for identification of named entities and 78.4% F-Score for the identification of complex events, when relaxed matching criteria are applied. The potential utility of PHAEDRA for developing/adapting text mining tools is shown through our training of baseline tools for NE and event recognition; encouraging levels of performance are illustrated, which compare favourably to other related efforts. In this section, we report on the design of the PHAEDRA corpus. We firstly describe the methodology that we used to collect documents for inclusion in PHAEDRA. Subsequently, we provide further details about each of the five different annotation levels. Finally, we explain our approach to normalising NE annotations to concept IDs in appropriate terminological resources. PHAEDRA is comprised of documents that are gathered based on: (1) publicly available resources (relevant to the PV domain) and (2) our own search—conducted in October 2015—for more recently published scientific abstracts. Specifically, we made use of the publicly available ADE , DDI 2013  and PK  corpora, which all contain annotations pertaining to PV-relevant named entity types. In searching for further documents, two strategies were taken. Firstly, we took the “Top 100 drugs” listed in the online pharmaceutical encyclopaedia Drugs.com and compiled a list of PubMed titles referenced in the “Side Effects” section for each drug. The PubMed eUtilities  were then used to download the content of corresponding abstracts. We also explored PubMed further by specifying the following query: (hasabstract[text] AND adverse drug reactions[MeSH Terms] AND drug interactions[MeSH Terms] AND (“2005/01/01”[Date - Publication] : “2016”[Date - Publication]) AND English[lang]). Overall, 2968 abstracts were gathered. In order to select the subset that would form our corpus, the abstracts were ranked according to the number of unique drug names that they contain. 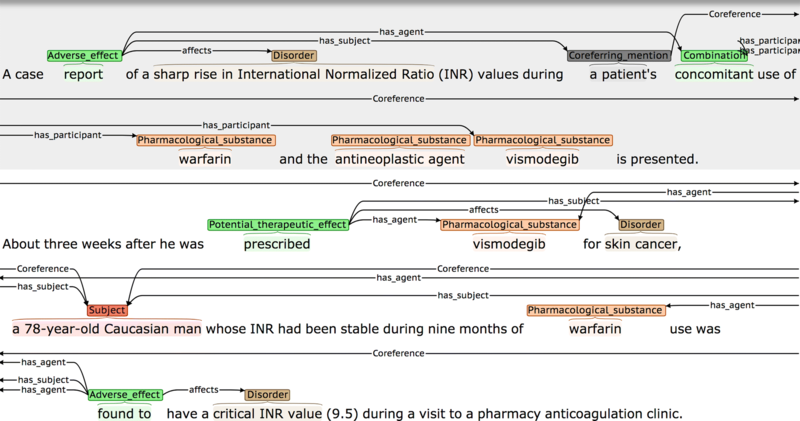 To this end, a drug NE recognition tool  was employed to annotate drug names in the set of otherwise un-annotated abstracts (retrieved based on information from Drugs.com and by searching PubMed). By selecting the 600 documents containing the highest number of drug names, we finally formed a corpus comprising 227, 125 and 52 abstracts from the ADE, PK and DDI 2013 corpora, respectively, and 193 abstracts from our own search. The design of each annotation level was guided by an examination of a wide range of relevant MEDLINE abstracts, to determine the types of information that are most frequently specified, combined with discussions with domain experts, which helped us to focus on the most important types of information to be encoded in our scheme. To our knowledge, PHAEDRA is the first freely available corpus focussing on PV that simultaneously includes annotations corresponding to all of our three chosen NE types, as a basis for linking the effects of drugs with information about the medical subjects in which they occur. The scope of each NE type is outlined in Table 2. We use the Pharmacological_substance label, since this category is largely based on the one used in the DDI corpus , whose scope is wider than prescription drugs. The Disorder category is based on, but not restricted to, the UMLS  Disorder semantic group. Our annotators were encouraged to consult the Medical Dictionary for Regulatory Activities (MedDRA)  as a guide to helping to determine when a phrase should be considered as a disorder. Most Subject phrases have a similar scope to , although our annotations extend beyond human subjects to cover different organisms and their sub-structures. Annotated NE spans may either be continuous or discontinuous. Discontinuous annotations consist of two or more disconnected spans of text, which denote a complete NE when concatenated. Discontinuous annotations are most often used in coordinated phrases, in which multiple NEs are mentioned, but there is a “shared” part of the NE that is mentioned only once. Examples are shown in Fig. 1. Definitions and possible participants of the four event types are shown in Table 3, while examples of each are shown in Fig. 2. Each event annotation is anchored to a word or phrase (known as the trigger) that denotes the occurrence of the event in the sentence. As can be seen in the examples in Fig. 2, the triggers of AE events often denote causality, using words and phrases like caused or due to, while PTE triggers frequently correspond to words or phrases denoting treatments or drug administration. Each event participant is assigned a semantic role label to characterise its contribution towards the event description, and is linked to the trigger. Following most other event annotated corpora, and according to the current capabilities of available automated event extraction tools (e.g., [89, 91, 92]), our scheme requires that event participants occur within the same sentence as the trigger. Different event types use different sets of semantic roles according to their semantics. The semantic roles that we have defined for each event type (e.g., has_agent) are outlined in the Possible participants column of Table 2 and are exemplified in Fig. 2, where the semantic roles are shown as labels on the arcs which link the participants to the trigger. For each event type, certain participant types are obligatory (i.e., the participant, or an anaphoric expression referring to the participant, must be present in the same sentence as the trigger in order for the event to be annotated), while other participant types are optional; the restrictions are detailed in Table 4. For each event type, it is permitted to annotate multiple participants with the same role label. The has_agent participant for both AE and PTE event types may either be a simple drug NE, or a more complex cause, encoded by a DDI or Combination event. The DDI event type is annotated when an interaction is explicitly mentioned, while the Combination type is used in cases where it is simply stated that two or more drugs are administered together. The Combination event type makes it possible to differentiate between cases where a number of different drugs taken in isolation are listed as common causes of a given adverse effect (see second AE event example in Fig. 2), and cases where the AE is only observable when two or more drugs are co-administered (see example for Combination event in Fig. 2). To collect the maximum amount of evidence about the range of ways in which all event types can be described in text, all instances of DDI and Combination events are annotated, regardless of whether they occur as the has_agent participant of AE and PTE events. For AE events, it may be useful to detect statements that a given medication has a potentially harmful effect, even if it is not stated which disorder(s) are affected. This additional information may be present elsewhere in the abstract, or else such underspecified information may help to flag drugs for which further research is needed. Although PTE events can be considered to be the opposite of AE events, we impose a different set of restrictions. Since most pharmacological substances are mentioned in the context of treatments, a simple statement that a drug has been administered is not particularly informative, and hence is not annotated as an event. Rather, we require the presence of one of two types of additional participants. These additional participants can correspond either to one or more affects participants, in order to allow the collection of evidence about which disorders are positively affected by which treatments, or to one or more has_subject participants, in order to collect evidence about the types of patients in which a treatment can be used safely. For DDI and Combination events, at least two drugs must be identified as participants for the events to make sense. Table 5 details the three interpretative attributes that are assigned to each event, while Fig. 3 provides some examples. Where possible, attribute-specific cue phrases are annotated and linked to the event. These are words/phrases in the same sentence as the event, which are used by the annotator to determine the chosen (non-default) value for a given attribute. It has been shown  that the annotation of such clue words can increase the accuracy of tools that are trained to assign the values of the attributes automatically. The second example of a negated event in Fig. 3 shows how some words may simultaneously act as event triggers and negation cues. Here, the word ineffective denotes that there is NO therapeutic effect, and hence it encodes a negated PTE. The final example for Manner in Fig. 3 illustrates how multiple types of interpretative information may be specified in the context of events; the significant effects of the stated drug combination may not happen in all patients, and hence the AE event is assigned a Manner value of High, as well as being marked as Speculated. The first of our two static binary relation types (Subject_Disorder) connects Subject phrases and Disorders, when the mentioned disorder corresponds to a complaint suffered by the subject(s) at the time when pharmacological substances are administered. We consider such relations to be important, since, in the context of discussing drug effects, medical subjects are frequently characterised by their existing medical conditions. Figure 4 shows an example of such a Subject_Disorder relation. In Fig. 4, the text span a patient with pulmonary hypertension and limited scleroderma could feasibly be annotated as a continuous Subject phrase. However, this would “hide” specific information about the characteristics of the patient, i.e., the particular disorders from which they suffer. The automatic recognition of such long spans is also likely to cause problems for an ML-based NE recognition system. Hence, we annotate Subject and Disorder phrases separately, and link them via Subject_Disorder relations. Figure 5 illustrates some of the diverse ways in which Subject_Disorder relations can be described in text. In the first sentence, the disorders suffered by patients are interspersed with the drug administered. In the second sentence, the condition suffered by the patient occurs as an integral part of a phrase describing their other characteristics, which requires the use of a discontinuous Subject annotation to allow the disorder to be identified separately. Our second binary relation type, is_equivalent, allows links to be established between NEs that constitute alternative names for the same concept within the same sentence. Equivalences may correspond to full drug names/disorders and their abbreviations, to generic drug names and their corresponding brand names or synonyms, etc. Some examples are shown in Fig. 6. Similar equivalences have previously been annotated in the context of biomolecular events . Since alternative names for a concept may be used in different parts of a document, the detection of is_equivalent relations could help to establish groups of events that mention a common participant, even if different words or phrases are used to refer to the same participant. These relations complement the information provided through the application of applying our automated normalisation method to NEs, described below. Our annotation scheme requires that event triggers and participants in PHAEDRA must occur within the boundaries of a single sentence. This helps to ensure that event annotation is feasible for annotators, whilst also allowing existing event extraction tools to be applied to the corpus. However, resolving underspecified expressions that act as participants to their co-referent NEs in other sentences is an important step to ensure the accurate extraction and/or interpretation of events. There is an annotated NE in a nearby sentence to which the underspecified expression refers. Linking the Coreferring_mention as a participant of the event results in an event that is valid, according to the restrictions set out in Table 4. The Coreferring_mention annotation and the previously annotated NE are linked using a Coreference relation. We have applied an automatic normalisation method to assign concept IDs to two of our three NE types, i.e., Pharmacological_substance and Disorder. Both of these concept types are extensively covered in existing terminological resources, and their normalisation has been demonstrated to be feasible by various previous studies (e.g., [54, 55, 110, 111]). 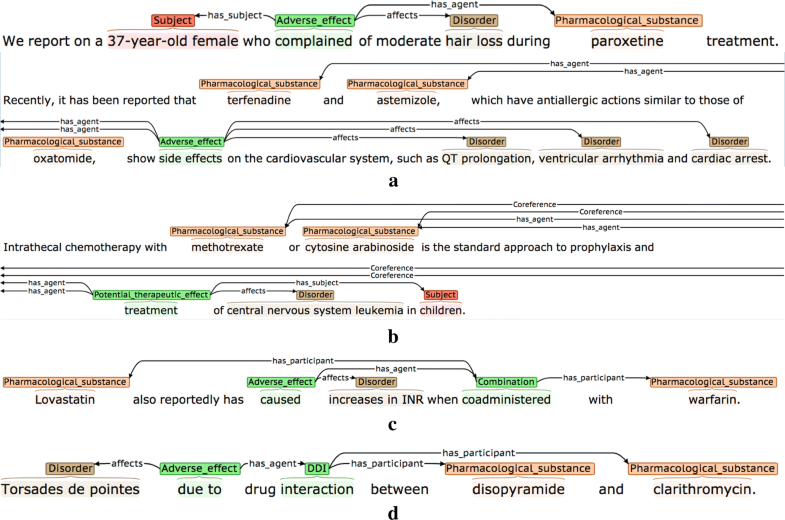 Although some terminological resources additionally include concepts that correspond to characteristics of Subject annotations (e.g., Patient or Disabled Group and Population Group in the UMLS Metathesarus), Subject annotations are less straightforward to map to specific concepts, according to the fact that the characteristics of medical subjects are highly divergent, and their descriptions may include multiple types of information, including number, gender, age, ethnicity, occupation etc. To carry out mapping of Pharmacological_substance and Disorder annotations in PHAEDRA to concept IDs in terminological resources, we considered two previously developed normalisation methods. The first  is based on the use of string similarity (according to the Jaro-Winkler distance ) such that, if an NE does not match exactly to a concept variant listed in the resource, the NE is mapped to the variant with which it bears with the greatest level of similarity. The second method, HYPHEN , takes a different approach, in that it is a hybrid method that employs a pipeline of different techniques to generate variations of the original NE mention (based on systematic syntactic and semantic variations of the original mention) and tries to match these generated variants against existing variants listed in the target terminological resources. To determine which of the above methods we would employ for concept normalisation in PHAEDRA, we compared their performance on a pertinent task, i.e., normalisation of disease mentions in the test partition of BioCreative V CDR corpus to MeSH concept IDs . The results are shown in Table 6. Acronym and abbreviation expansion and context-sensitive disambiguation (e.g., elevated ICP -> elevated intracranial pressure). Conversion of plural forms to singular (e.g., thrombi-> thrombus). Generation of English equivalents of Neoclassical compounds (e.g., hyperglycemia -> high blood sugar). Generation of Neoclassical equivalents of English terms (e.g., thyroid englargement -> thyromegaly). Generation of syntactic variants (e.g., abdomen pain -> painful abdomen). Generation of synonyms (e.g., cardiac asystole -> cardiac arrest). The processes are applied in the order shown above, based on the results of experiments to determine the optimal ordering. The output of each process is passed as input to the next technique in the sequence. This can increase the accuracy of normalisation, since multiple transformations are sometimes necessary to allow mapping to the terminological resource, e.g., hypertensive eyes -> (singular) -> hypertensive eye -> (syntactic) -> eye hypertension -> (Neoclassical) -> ocular hypertension [UMLS: C0028840]. The pipeline is terminated as soon as one of the techniques generates a variant that matches a term in the terminological resource. In this section, we firstly cover several statistics regarding the PHAEDRA corpus. Initially, we present and discuss inter-annotator agreement (IAA) rates between two annotators for different levels of annotation in a subset of the corpus, as a means of determining the quality of the annotations. We subsequently report on various statistics regarding the annotations in the full corpus, including the results of applying the HYPHEN method to normalise the Disorder and Pharmacological_substance NE types, and we highlight some of the annotation trends, which help to justify that choices made in the design of the corpus were well motivated. Finally, we describe our experiments in using the corpus to train ML classifiers to recognise two levels of information automatically, i.e., NEs and events. We trained two annotators with domain expertise in the application of the annotation scheme and the use of the brat annotation tool . Several rounds of practice annotations resulted in updates being made to the guidelines, to resolve potential weaknesses and omissions in the initial version. All 597 abstracts were annotated by a single annotator; one quarter (i.e., 150) of the same set of abstracts was independently annotated by the second annotator at a mid-point in the annotation effort, to allow IAA results to be calculated and analysed. As a result, the guidelines were further revised; the main annotator re-reviewed their previous annotations and completed the annotation of the remaining abstracts. In this section, we report on the IAA rates for the different levels of annotation, and discuss some of the more challenging cases. Table 7 reports the IAA rates for NEs, with separate figures for exact span agreement (i.e., both annotators have selected exactly the same NE category and the same text span) and relaxed span agreement (i.e., the annotators have selected the same NE category and overlapping text spans). Although consistent span selection can be important for ML algorithms, the potential variability of certain NEs can make many span selection choices difficult, despite the provision of numerous pointers in the guidelines. Therefore, overlapping spans provide evidence that the same NE has been identified by both annotators, even if the spans do not match exactly. The overall relaxed and exact agreement rates are very high, and show that the annotators have a similar understanding of which phrases should be annotated as NEs. The results are comparable with previous efforts that annotated similar entity types [42, 61, 62]. Only the Disorder category exhibits a notable discrepancy between exact and relaxed matching. Some examples of disagreements for Disorder spans are shown in Table 8. Descriptions of disorders often include reference to anatomical entities and/or adjectives describing the nature of the disorder, which may extend beyond a single noun phrase into a following prepositional phrase. According to the guidelines, such types of information should only be included within Disorder spans if they are considered to be part of the disorder name. This can be a difficult choice, especially if the disorder name is not present in the MedDRA resource used as a guide by the annotators, as is the case for limited scleroderma. The word limited appears to refer to the extent of the disorder, and hence, it would be feasible to consider it as a cue for Manner. However, the complete span limited scleroderma is listed elsewhere as a named subtype of scleroderma . Agreement rates for Subject annotations are the lowest of the three NE categories, although there is no discernible difference between the exact and relaxed matching rates. Disagreements generally occurred when patients were characterised in less usual ways. Examples include elderly residents of a long-term care facility, patients undergoing parathyroidectomy and patients for whom surgery is not possible. Event identification (i.e., the extent to which the annotators agree that particular events are described in a given sentence). Participant identification (i.e., the extent to which the annotators agree on which participants to annotate for events whose existence they agree upon). Event identification involves selecting an appropriate trigger word or phrase for the event. In , agreement for this task was assessed by determining the extent to which annotators selected the same (or overlapping) trigger spans. However, the event types of interest in that corpus (i.e., gene regulation and expression events) were rather semantically restricted, as evidenced by the fact that around 50% of the 3000 events in the corpus were described using one of ten commonly occurring trigger words. We found that the diversity of possible triggers for our event types was much greater, especially for AE and PTE events. For example, while the most preferable triggers for AE events are those denoting causality or association, e.g., produce or associated, there are many cases in which a sentence describing an AE does not include such a word. Thus, the guidelines suggest possible alternatives, including temporal-related words (e.g., after) conveying that an adverse effect occurred following the administration of a drug, or else a word denoting that the drug is harmful (e.g., toxicity), etc. Triggers occur in the same sentence AND they are assigned the same event type AND they share at least one “core” participant (i.e., at least one has_agent, affects or has_participant participant must be the same in the matched events). Table 9 shows agreement rates for event identification, which are closely comparable to those achieved for the gene regulation and expression event annotation task reported in , where agreement levels of around 77% F-score were achieved. The high agreement rates for DDI events, with little difference between strict and relaxed matching, are to be expected, since such events are almost always denoted by the word interaction or interactions. Whilst Combination events have the same structure as DDI events, the lower agreement is likely to be explained by the greater variety in possible triggers for Combination events, together with the potential ambiguity of some of these triggers. For example, although the word and is frequently a trigger for Combination events when it is used to conjoin two pharmaceutical substances, there are cases where and does not refer to their combined administration, and so careful reading may be required. Cases such as the one shown in sentence S8, where there is disagreement between the annotators about whether the trigger should be both or and, help to explain why there are discrepancies between the strict and relaxed matching rates. (S8) We discuss a case with significant progressive peripheral neurological deterioration following administration of both fludarabine and cytarabin. In Table 10, we show the extent to which the annotators identified the same participants with the same semantic roles for events whose existence they agreed upon (according to the relaxed criteria introduced above). Event participants chosen by the two annotators are considered to match if their text spans overlap, and they are assigned the same semantic role. The levels of agreement for participant identification and classification reach similar levels to those reported in  (i.e., 88% F-Score). Disagreements concerning has_agent are more frequent than for affects participants. The most common type of disagreements arising in relation to this role concern whether the agent corresponds to a single pharmacological substance or a combination of them. For example, in sentence (S9), a careful reading is required to understand that the therapy for Parkinson’s disease is a combination of ropinirole, levodopa and carbidopa, and hence the has_agent participant of the PTE event in this sentence should be Combination event, which links them together. (S9) Ropinirole was added to his current therapy for Parkinson disease, with a corresponding decrease in the dose of levodopa/carbidopa to allow levodopa sparing. We found that has_subject participants are sometimes missed when there are multiple events in a sentence and the subject information is not close to the event trigger. In the sentence shown in Fig. 9, for example, one annotator failed to link the Subject phrase to the AE event as well as the PTE. Table 11 shows the agreement rates for our two relation types. These figures are comparable to those reported for a number of different medically-related relation annotation tasks (e.g., [61, 62]). Subject_Disorder relations were sometimes overlooked in more complex sentences, such as the one shown in Fig. 10, where the disorder (i.e., refractory depression) suffered by the subject at the time of the administration of the treatment occurs at the end of the sentence, after the introduction of several other types of complex and interlinked information. In certain cases, one of the annotators was found to be over-annotating is_equivalent relations. In Fig. 11, for example, the text spans in parentheses correspond to descriptions of the disorder names that precede the parentheses, rather than constituting alternative names for the disorders. Since these bracketed phrases do not comply with our guidelines for Disorders, they should NOT be annotated as such, and there should be no is_equivalent relations. The agreement rates for the assignment of event attributes are shown in Table 12. For the Negated and Speculated attributes, comparably high levels of agreement are achieved. Since both of these are binary attributes (i.e., the value is either true or false), the decision is more straightforward than for the three-valued Manner attribute. Confusion may arise when a negation word occurs in the sentence, but it does not negate the event. In Fig. 12, for example, the negation concerns the lack of a previous mention of the event the literature, rather than saying it is not true. Since this phrasing suggests that the authors consider the event to be plausible, the assignment of the Speculated attribute seems more appropriate than the Negation attribute. Similar care has to be taken to ensure that speculative phrases occurring in the sentence are indeed modifying the event of interest. One of the annotators marked the DDI event shown in Fig. 13 as Speculated, according to the presence of the word possible. However, the speculation is not related to whether the DDI took place, but rather about what caused it. For the Manner attribute, agreement is usually reached when the manner cue directly modifies the event trigger. However, more careful reading is needed in sentences such as Fig. 14, where the description of the disorder disturbed sleep, rather than a modification of the event trigger, provides evidence that a Manner value of Low should be assigned to the AE event. We examine events that are agreed by both annotators, according to the relaxed criterion for event matching introduced above. The Coreferring_mention spans annotated by each annotator are linked to the same NE in a neighbouring sentence via a Coreference relation (i.e., the linked NEs must have overlapping spans, and must be assigned the same NE category). By applying these criteria, we achieved an agreement rate of 50.91 F-Score. This is somewhat lower than the agreement rates for other levels of annotation. Although coreference involving Subjects is most common, and is generally straightforward (i.e., an initial descriptive phrase introducing the subject(s) will subsequently be referenced using phrases such as she or them, etc. ), our IAA analysis showed that there were several types of more difficult cases that could lead to disagreements, some of which are illustrated in Figs. 15, 16 and 17. Although the more descriptive NE phrase is normally introduced prior to the shorter co-referring phrases, this is not always the case, as shown in Fig. 15. Here, it is necessary to read forward to the second sentence to determine that the underspecified phrase a patient in the first sentence actually refers to a 78-year-old Caucasian man. It was found that one of the annotators initially tended only to look forwards for coreferring mention phrases, and so was often missing cases such as this. Examples such as the one shown in Fig. 16 can also cause problems, since it may be ambiguous whether the phrase the reaction in the final sentence refers to the disorder TEN or urticarial rash. Finally, in Fig. 17, it is necessary to read the text carefully to realise that the phrase symptomology refers back to symptoms introduced two sentences previously. To maximise the number of NEs that can be mapped to concept IDs, since this helps to ensure that the corpus annotations are as useful as possible. To ensure that HYPHEN can achieve acceptable results when normalising NEs to the chosen resources. For the final mappings, we chose the resources which allowed the greatest number of NEs to be mapped to concept IDs, i.e., UMLS concept unique identifiers (CUIs) associated with SNOMED-CT concepts for Disorder and MeSH IDs for Pharmacological_ substance. Both of these resources have constituted the target resources for normalising the respective entity types in other research efforts (e.g., [54, 110]), thus helping to demonstrate the utility of the methods. Dictionary lookup (i.e., exact matching of NEs against variants in the respective resource). Results of applying the UMLS Norm program , which transforms terms in various ways, such as removing word inflections, stop words and re-ordering words alphabetically to try to match terms occurring in text against variants listed in a resource. Tables 14 and 15 show that HYPHEN can considerably outperform the baselines in normalising both types of NEs. The performance for normalisation of disorders in the ShARE/CLEF corpus is only slightly lower than that reported in Table 6 for normalisation of diseases to MeSH concepts in the BioCreative V CDR corpus (87.03% F-score). This result helps to demonstrate the robustness and stability of HYPHEN when the parameters of the normalisation task change, since the ShARE/CLEF corpus concerns both a different text type (clinical records rather than biomedical abstracts) and normalisation to a different terminological resource, compared to the task reported in Table 6. Normalisation performance is even higher for chemicals, possibly because the types of names used to refer to them are frequently rather finite or follow rule-based conventions . In Tables 16 and 17, we report on the number of Disorder and Pharmacological_substance NEs to which HYPHEN is able to assign IDs corresponding to concepts in either SNOMED-CT or MeSH. We compare this figure to the number of ID assignments achieved by applying the baseline methods, which is considerably lower. Table 18 shows examples of how HYPHEN’s pipeline of variant generation techniques can help to achieve successful normalisations of NEs in PHAEDRA. In cases where multiple transformations of the original NE are required to achieve a match with a variant listed in the resource, the different steps and intermediate variants generated are shown. In this section, we provide and discuss some characteristics of the final PHAEDRA corpus, which help to demonstrate that it will be usable as intended, i.e., to allow the training of ML tools to detect various types/levels of information relating to PV in textual data. Table 19 shows general statistics for the different annotation levels, while Table 20 shows some more detailed statistics regarding event participants and attributes. The numbers of NEs, events and relations are similar to those that have previously been shown to be sufficient for ML training purposes (e.g., [39, 42, 43, 61, 85]). This is confirmed in the next section, which reports on the use of the corpus for NE detection and event extraction. The number of events annotated per abstract varies between 0 and 20, with 75 abstracts containing no events at all. Thus, it is not always the case that abstracts containing the appropriate entity types, and which our search strategy selected as covering the relevant subject, actually contain events. Event recognition tools should be capable of distinguishing between cases of valid and invalid events, when the correct NE types are present in a sentence and the right subject area is covered by a document. The fact that PHAEDRA contains abstracts with varying numbers of events should help to ensure that event recognition models trained using the corpus can learn the contexts in which entities of the correct type should be linked to form an event, and thus avoid the potential problem of “over-trained” models, i.e., those that are liable to recognise events, even when they are not actually present. There is a large difference in the range of unique triggers annotated for each event type, with the greatest variety of triggers occurring for the AE event type. Common triggers for this event type include those denoting causality, association or risk (induced, associated, caused, resulting, related, risk) or temporal terms (after, follow, during), while others relate to the commencement of a disorder (develop, occur, trigger, producing, manifestation), to specific effects on a disorder (exacerbation, aggravating, worsening, acceleration), to harmful effects (toxic, side effect, intoxication, harmful effects, neurotoxicity) or to potential for harm (borne in mind, raises important questions, prescribed with caution). Triggers for PTE events appear to have a less variable semantic scope than AE events, consisting mainly of words relating to treatment, therapy or administration (treated, received, prescribed, therapy, taking, use) or to the positive effects of treatments (effective, prevent, resolve, efficacy, improved, controlled, decreased, benefit, recovery, disappeared, reversing). There are also many different triggers for Combination events (and, with, plus, combination, concomitant, concurrent, co-treatment, conjunction, simultaneously, mixtures, multiagent, given with, used together, added, boosted, etc.). In contrast, the triggers for interactions are highly restricted, mostly consisting of variations on the word interaction (interactions, interact, interacts), possibly with a modifier (pharmacokinetic interaction, drug interaction). Negation cues are also very limited and include no, not, without, failed, despite and inactive. The most common cues for High and Low Manner cues, respectively, are significant and rare. Other cues mainly relate to severity (severe, drastically, critically, dangerously, life threatening, minor), completeness of the effect (completely, partially) or frequency (seldom, uncommon, less frequently). Cues for Speculated events are far more variable. The most common are potential, may, possible, risk and probable, while others mark events that are mentioned in an evaluative context (assess, evaluate, investigate, study, examine, hypothesise), various degrees of tentativeness (suggest, seem, believe, think, propose, presume, unlikely) or expressions of caution, which may indicate potentially harmful effects (with caution, care should be taken/exercised, close attention must be paid). In the GENIA event corpus , it was found that approximately 8% of all the molecular-level events were marked for speculation, which is around half as many as in the PHAEDRA corpus (14%). The higher level of speculation in our corpus could be due to the need to report drug effects with some degree of caution, since different patients are likely to respond/react in different ways. The occurrence of this type of speculation is reinforced by some of the most common types of speculation cues in our corpus (e.g., potential and risk), which do not feature at all in the list of the most common speculation cues in the GENIA event corpus. One of our motivations for using event annotations is to link contextual information about medical subjects with drug effects. The statistics for NE annotation show both that such information is frequently specified in abstracts, and that there is a large degree of variation in the nature of subject descriptions. These variations may concern numbers in a subject group, age, gender, life stage (e.g., children adults, elderly), ethnicity/nationality, lifestyle habits, (a white man with a long history of smokeless tobacco use), genetic characteristics (subjects with the cyp2c19 poor metabolizer genotypes) or previous surgery (an 18-yr-old female kidney transplant recipient), among others. The fact that around 28% of all events have at least one has_subject participant provides verification of the relatively high frequency with which drug effects are qualified with subject information. Furthermore, a quarter of all AE and PTE events identifies three distinct types of participants (i.e., has_agent, affects and has_subject), which clearly illustrates the need to move beyond binary relations to fully encode the different types of information about drug effects that are frequently specified in text. A further motivation for using events is to allow complex causes of drug effects to be encoded. The fact that 415 events (around a fifth of all PTE and AE events) have has_agent participants that are themselves events (i.e., Combination or DDI) provides evidence that such descriptions occur with reasonable regularity. As mentioned previously, events in our corpus are restricted to those whose triggers and participants all fall within the scope of a single sentence. This decision was mainly motivated by our desire to ensure that PHEADRA can be readily used to train practical TM tools, since most existing ML-based event extraction systems (e.g., [89, 91, 92]) are only designed to extract sentence-level events. However, information in text can be described in many different ways, and the details of an event may not always fall neatly within the scope of a single sentence. Our co-reference annotation is intended to help with this, in that it is possible to annotate event participants that correspond to anaphoric expressions (which would normally be considered too vague to annotate as NEs), and to link them to their referent NEs in other sentences. Event is not annotated due to implicit reference to required participants (see Fig. 18). In Fig. 18, it is implicit that the disorder SS (serotonin syndrome) mentioned the second sentence occurs as a result of the treatments mentioned in the first sentence (i.e., there is an implicit AE event). However, since the second sentence mentions neither the pharmacological substances nor anaphoric expressions that refer to them, no AE event is annotated. Events are annotated, but certain participants are missed due to implicit reference (see Fig. 19). In Fig. 19a, it is implicitly understood that the disorders in the last sentence are caused by aripiprazole, which is mentioned only in the first sentence. Hence, the final sentence contains additional affects participants that cannot be annotated. Similarly, in the sentence shown in Fig. 19b, the second sentence is talking about the same case as the first, and hence it is implicit that the same medical subject in involved, although the phrasing means that this information cannot be annotated. Events are annotated, but implicit reference means that one or more participants are incomplete/incorrect (see Fig. 20). In Fig. 20, the first sentence states that medical subjects received two different combinations of drugs (i.e., linezolid and citalopram or linezolid and escitalopram). However, although the second sentence explicitly states that an adverse reaction occurred in a patient treated with citalopram, it is implicitly understood that this actually means that the patient was treated with a combination of citalopram and linezolid. This leads to the has_agent participant being annotated incorrectly, even though the annotation seems correct when considering the second sentence in isolation. Co-reference annotation facilitates annotation of certain event participants. In Fig. 21, the co-reference annotation allows the information about the medical subject introduced in the first sentence (i.e., A 71-year-old woman) to be linked to both the PTE and the AE event in the second sentence, via the anaphoric expression she. Co-reference annotation allows annotation of events that would otherwise remain un-annotated. In the second sentence of Fig. 22, the AE event denoting that IFN-beta (referred to in this sentence using this therapeutic agent) has the potential to cause autoimmune complications, would remain un-annotated, without the use of co-reference annotation. The counts for each of the five cases are shown in Table 21, along with the total number of events in our 20 abstract sample. An important result from our sample analysis is that it provides evidence that our annotation scheme is sufficient to capture the majority of information about events that is specified in text. In particular, of the 278 events that are annotated, 234 (i.e., 84.17%) can capture all information that is specified about the event. While co-reference annotation is only critical in a small number of cases to ensure that events are not missed, it helps with the identification of certain participants in a larger number of cases, thus helping to demonstrate its ability to ensure that event annotations are as complete as possible. A further important result of our analysis is that the number of events that remain completely un-annotated in our sample, according to implicit references, is also quite small (i.e., 18). Thus, even if we had annotated events whose participants are described beyond the boundaries of a single sentence, then we may estimate an increase in the number of events annotated of only about 6.5%. Most of the issues with events that are annotated concern the lack of a phrase (either NE or anaphoric expression) that refers to the participant in the event-containing sentence. However, it is often the case that, although information may be scattered amongst sentences when it is initially introduced, the conclusion of the abstract tends to provide a concise summary of the main findings of the study, including all relevant participants. Such a sentence is illustrated in Fig. 23, where the medical subject is explicitly mentioned and can be linked to the AE and PTE events, even though the subject is not explicitly referred to in earlier sentences that introduce these events. Our sample analysis suggests that the proportion of events that is completely missed due to implicit reference is quite small, and that events with missed participants are often stated more fully elsewhere in the abstract. As such, the benefits of sentence-based event annotation, in terms of the ready availability of a range of tools that can be trained to recognise them, outweigh the fact that a relatively small proportion of information is missed. In this section, we demonstrate the utility of the final annotated PHAEDRA corpus, by reporting on its use to train two ML models (one for NE recognition and one for event extraction), employing commonly used tools. For NE recognition, we use NERSuite , which has previously been used to train other high-performance, medically-relevant NE tools [42, 120]. We randomly split the complete corpus into a training set (359 abstracts), development set (120 abstracts) and test set (118 abstracts). We trained an NERSuite model using the training set, and performed evaluation against the test set. The results are shown in Table 22, where we show both exact and relaxed span matching rates. Precision is high for all categories, and especially when the relaxed matching criterion is used. The lowest discrepancy between exact and relaxed matching rates occurs for the Pharmacological_substance category, which can be explained partly according to our previous observation regarding the lesser variability in the structure of these terms, compared to others, and partly since NEs belonging to this category are typically shorter than those belonging to the other categories (see Table 19), with many instances being only one word long. However, the large number of unique drug names in the corpus appears to contribute to the lower recall. Thus, the use of additional features from a domain specific drug resource is likely to be beneficial. Recognition errors for the Disorder category are particularly likely to occur for longer spans (e.g., angiomatous enlargement of the gingiva, Advanced Previously Untreated Non-Small-Cell Lung Tumors) and spans that constitute or contain acronyms (e.g., NSCLC, elevated INR). The fairly large discrepancy between relaxed and exact matching rates for this category appears to occur largely for mentions of specific, descriptive disorders. In such cases, it is more likely that the model will predict a shorter, more general span that misses the descriptive details of the gold standard span, e.g., swelling instead of swelling in his right buttock, or acute myelogenous leukemia instead of adult de novo acute myelogenous leukemia. In terms of Subject annotations, recognition failures can occur for rare types of subjects, e.g., non-human subjects such as mice, animals, Schistosoma mansoni, or more unusual types of descriptions, such as extensive metabolizers. Fine details in long subject descriptions may also be missed, e.g., in one case, adult patients is predicted instead of adult patients (15-60 years old), while in another, male is predicted instead of male 60 yrs of age. Given the related subject area, we can compare our results broadly to those reported for medically related NEs in the historical medical corpus, HIMERA, which also used NERSuite . Using the default NERSuite configuration, the results achieved for the Condition NE class in HIMERA (broadly comparable to our Disorder class) were 73%/82% F-Score for exact/relaxed span matches, which are quite similar to our scores of 66%/80% F-score. It should also be noted that our current corpus covers a wider range of disorders than HIMERA, which was primarily restricted to documents concerned with lung diseases. Although higher scores for disorder recognition were achieved in another study , i.e., 75% exact/88% relaxed F-Score, additional dictionary features and a larger training corpus were used; it was shown in experiments on the HIMERA corpus that the use of dictionary features can boost F-Scores by up to 6%. Our recognition performance for Subject entities is somewhat lower than that achieved for the HIMERA corpus (74% relaxed/81% exact for HIMERA vs. 69% relaxed/74% exact for our corpus). However, a large number of the subject annotations in HIMERA are short, vague spans such as cases and patients, whilst we require longer and more descriptive subject phrases to be annotated. HIMERA also annotated treatments, although they had wider semantic scope than our pharmacological substances, covering all types of treatment and investigational techniques. This helps to explain why our performance for pharmacological substances (75% exact/80% relaxed F-Score) is higher than that achieved in HIMERA (64% relaxed/57% exact F-score). We used the EventMine system  for automatic recognition of events. Regular improvements to this system have assured its state-of the-art performance when applied to texts belonging to different subject areas and text types [90, 91, 104, 121]. EventMine applies a pipeline of TM tools to text in which NEs have already been recognised, in order to recognise event triggers and participants, to assign appropriate semantic categories to them and to link them together into potentially complex event structures. We trained an EventMine model using 479 annotated abstracts (from the training and development sets), and used the remaining 118 abstracts (in the test set) for evaluation. Figure 24 shows examples of complex events that are successfully detected by the model, including those with three different types of participants (a), and those whose participants are themselves events (b). Sentence (c) shows that the model can successfully distinguish the correct event participants, even when there are multiple NEs of the same type in the sentence. To assess of the performance of the model, we firstly determined how well it can identify the same events that are annotated in the gold standard, by matching triggers (see Table 23). We used the same relaxed criteria for matching triggers that were introduced above for calculating IAA, according to our observations about the diversity of potential triggers for most of our event types, and the fact that there may be multiple candidate triggers for a particular event within a given sentence. The imbalance between precision and recall appears to be a general feature of models trained using EventMine. However, recall is very high for DDI events, probably due to the smaller number of triggers that are possible for this event type. Acceptable levels of precision are obtained for all event types; the highest precision is achieved for Adverse_Effect events, providing evidence that certain words and phrases in a sentence can reliably predict the presence of this event type. Lower recall may be caused by events with unusual phrasing (see Fig. 25), or unexpected sentence structure (see Fig. 26) being missed by the model. Figure 27 shows some examples of events erroneously recognised by EventMine. In sentence (a), only a single PTE event should have been recognised. However, presumably since treated and for are both common triggers for PTE events, two separate events were recognised by the model. In sentence (b), the gold standard includes only a single Combination event, with all three pharmaceutical substances being identified as participants. However, presumably because Combination events occur more commonly with only two participants in the training data, EventMine has recognised two separate events with the same trigger, but each linking a different pair of drugs. Table 24 reports on the degree to which event participants of different types are correctly recognised in matched events, i.e., those events recognised by EventMine whose triggers can be matched to events in the gold standard. In general, the results for all participant types are quite high, with the best results being achieved for the has_participant role. The results provide evidence that the EventMine model is able to identify both core participants and contextual information about medical subjects with a high degree of accuracy. We also carried out an evaluation based on the one used in the BioNLP ST evaluations. The original evaluations determined the extent to which models are able to carry out the joint task of identifying the existence of events and detecting their primary participants, i.e., their Themes (the participants undergoing change) and their Causes. To perform a similar evaluation, we consider the primary participants of our event types to be has_agent and affects for the AE and PTE event types, and has_participant for the DDI and Combination event types. While in the BioNLP STs, automatically recognised events are only matched against those in the gold standard if they have overlapping trigger phrases, we use the more relaxed criteria for matching trigger phrases, as introduced above. The results are shown in Table 25. The overall results are slightly lower than when EventMine was applied to a task of broadly comparable complexity and text type, i.e., the BioNLP’09 ST of extracting molecular level events from biomedical abstracts , for which an overall F-Score of 53.29% was achieved . In the corpus used for this ST, however, around a third of all events have only single participant, and performance for these event types was quite high (70.44% F-Score). In contrast, all events in our corpus can potentially have multiple participants and in most cases, multiple participants are actually required. As such, we would expect overall event extraction performance to be lower for our corpus. EventMine’s performance for events of comparable complexity is broadly similar across the two corpora. For example, in the BioNLP shared task, the Binding event type is comparable to our Combination and DDI event types, in that there are potentially multiple primary participants, each having the same semantic role label. EventMine’s performance in recognising Binding events was 52.62% F-Score, while the combined performance for Combination and Binding events in our corpus is 50.98%. Similarly, performance on the BioNLP’09 corpus for event types that take two types of primary participants (i.e., Theme and Cause) is 40.60% F-score, while for our two event types that have two primary participant types (i.e., AE and PTE), the performance is 44.96% F-score. The parallels between the performance of EventMine on events of similar complexity but differing semantics provide additional evidence that the annotation quality in the PHAEDRA corpus is similar to that in the widely used BioNLP’09 ST corpus, which has been used extensively to train event extraction models. In this article, we have reported on the development of a novel, freely available corpus, PHAEDRA, that is annotated with multiple levels of information that allow complex details relevant to PV studies to be encoded. It is intended that this will act as a stimulus for the development of TM methods that are considerably more sophisticated than those currently available for this domain, which are at present largely restricted to identifying binary relations between drugs and diseases or drug–drug interactions. 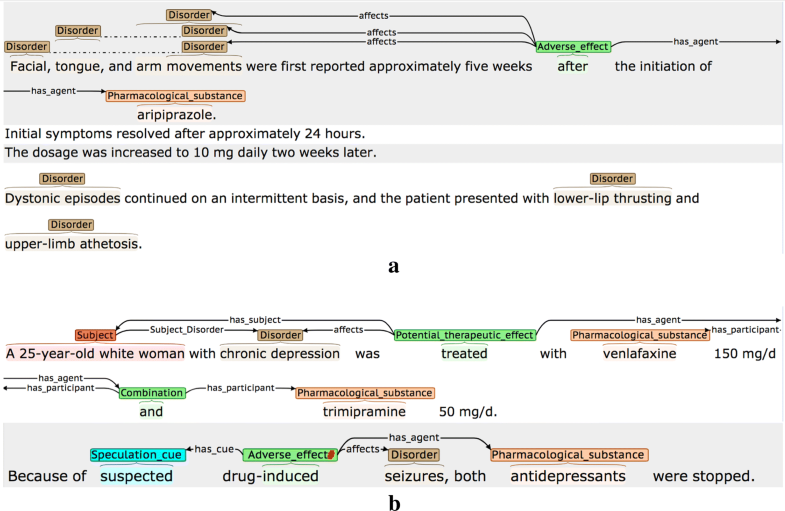 In particular, the event-centric annotations in our corpus can encode drug effects with complex, multi-drug causes, and include detailed information about the medical subjects in which such effects occur. Moreover, interpretative attributes categorise drug effects according to their intensity, and can distinguish between tentative and speculated effects. The automatically-added links between Disorder and Pharmacological_substance NEs add further value to the corpus, e.g., by helping to group together events from different documents that involve the same concepts, even if these concepts are mentioned in different ways. Despite the complexity of the annotations, their automated recognition is within the capabilities of current TM tools. We have provided an initial demonstration of this by training baseline classifiers for two of the levels of annotated information, i.e., NEs and events, using existing tools that have been widely applied to other types of annotated corpora. Even by using the default settings and feature sets in training these models, we obtained performance levels that compare highly favourably to those achieved for related corpora. We hope that our work, including our analysis of the types of errors made by the classifiers, will encourage the development of novel classifiers with even higher performance. As future work, we intend to extend our corpus in several ways. Firstly, we aim to extend/improve upon the current annotations in the corpus. This will include manual verification/editing of the automatically-added “silver-standard” links between NEs and concept IDs, as well as the addition of further relation/event types, e.g., to encode pharmacokinetic mechanisms responsible for drug effects. We also plan to augment the documents in the corpus with further types of text that have been identified as being highly relevant to PV studies, including clinical records and social media postings. Our ultimate aim is to facilitate the training of ML classifiers that can robustly extract and combine complex information from multiple information sources. By mapping this information to an upper-level ontology (e.g., , which includes a set of relations to describe processes in terms of their participants and their actions, as well as the ability to encode attributes of such processes), we can increase the ease with which information extracted by these classifiers can be queried and integrated with domain-specific knowledge from other information sources. These planned improvements will all help to improve the feasibility of developing novel, high-performance tools that can assist curators in creating and maintaining PV knowledge resources that are as comprehensive and complete as possible, in order to ensure that such resources constitute a reliable and trustworthy means of assessing drug safety in patients with diverse characteristics. PT, RB, SA and JT designed the annotation scheme. PT, RB, SD and KU produced and updated the annotation guidelines. PT and RB trained and supervised the annotators. SD and KU carried out the annotations. PT, SD and KU analysed the corpus and calculated the statistics. RB trained the NE recognition and event detection models based on work carried out by SA and JT. PT wrote the manuscript. RB, SA, SD and JT revised and edited the manuscript. SA supervised all steps of the work. All authors read and approved the final manuscript. We thank Paloma Martinez Fernandez, Isabel Segura Bedmar and Maria Herrero Zazo for their helpful inputs to annotation scheme and their feedback on earlier drafts of the annotation guidelines. We also thank Piotr Przybyła for his help with the visualisation of the annotations with the brat software. The PHAEDRA corpus and annotation guidelines are available from http://www.nactem.ac.uk//PHAEDRA/ with a Creative Commons BY-SA licence. The work described in this manuscript has been supported by the been supported by the EPSRC and MRC (MMPathIC project, Grant. No. MR/N00583X/1), the BBSRC (EMPATHY project, Grant No. BB/M006891/1) and the EC/H2020 (OpenMinTeD project, Grant No. 654021). Fan J-W, Sood N, Huang Y (2013) Disorder concept identification from clinical notes an experience with the ShARe/CLEF 2013 challenge. Working Notes for CLEF 2013 Conference. http://ceur-ws.org/Vol-1179/CLEF2013wn-CLEFeHealth-FanEt2013.pdf. Accessed 6th August 2018.